Jarrin Root is given to you by Astrid as part of a Dark Brotherhood quest to assassinate the Emperor. The sample from this quest is the only one available in the game. It can be used for alchemy if you choose to kill the Emperor in some other way. The most valuable potions in the base game all involve Jarrin Root, but as there is only ever one sample available, it is not considered or placed in lists of valuable potions. There are 19 different poisons that can be made with Jarrin Root and base game ingredients that are all more valuable than the most valuable created with Giant's Toe (the most valuable farmable ingredient). With the addition of Salmon Roe with Dawnguard and Boar Tusk with Dragonborn, Jarrin Root is relegated to a marginal third place (it retains competitiveness with Boar Tusk through mixes with other add-on ingredients) for most expensive ingredient. The first two combinations make the same poison, while the third combination notably makes the only five-effect poison available in the base game. The effects of this poison are Damage Health, Damage Magicka, Damage Magicka Regen, Damage Stamina, and Frenzy. With 100 Alchemy, the damage health effect will have over 1000 points of damage, enough to kill almost everything in the game. 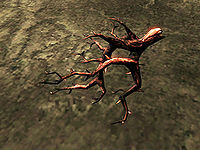 The Jarrin Root cannot be planted in the gardens of player-owned housesHF. If you eat the root, you will receive 200-600 points of poison damage. With a skill level of 100 in Alchemy, all five levels of the Alchemist perk, and the Poisoner perk, a Poison of Damage Health made with Jarrin Root will have a magnitude of 3000 damage. Wearing four pieces of apparel each with a 25% Fortify Alchemy enchantment will bring this up to 6000 damage. This page was last modified on 22 August 2018, at 20:02.